WESTBROOK — Waterstone Properties Group is expected to appear before the Planning Board next month to get the go-ahead for its ambitious plan to turn the Pike Quarry site into a mixed-use commercial, residential and retail center. Waterstone Properties Group and its team laid out the first phase of the four- to five-phase project, with details on traffic and parking, at a Planning Board workshop Tuesday. That phase will include a Market Basket, a bank, a restaurant and several other retail options. The board is expected to review and vote on the official amended site plan at its meeting on Tuesday, Sept. 18. In 2016, the board approved a site plan from a different ownership group for a large 500,000-square-foot retail complex anchored by Wal-mart. Waterstone bought the property in 2017 and because its vision is different, it needs amended site plan approval from the board before moving forward. The first phase, to be built in the northwest corner of the Main Street property, will be accessed through a road across the street from the entrance to Westbrook Crossing, as well as via an unsignalized driveway off Larrabee Road by Terminal Street. 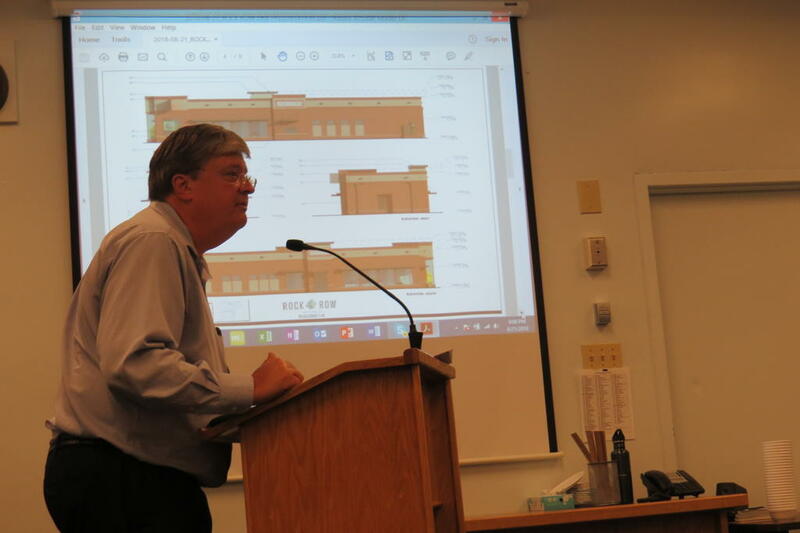 Derek Campbell, a traffic engineer with Sebago Technics, said other entrances off Larrabee Road and Westbrook Arterial proposed in the former site plan will not be constructed at this time, but could be when future phases get developed. While Market Basket is the only tenant that has been named, Waterstone is talking with national, regional and local retailer to occupy the space. Wayne Morrill, of Jones and Beach Engineers in New Hampshire, said Waterstone’s plan will generate 134 vehicle trips in the peak morning hours, 530 in the peak afternoon hours and 860 on Saturdays, much less than the anticipated traffic from the previous site plan, which would have anticipated 351 vehicle trips in the morning peak, 1,217 in the afternoon peak time and 1,853 Saturday. Coinciding with the project, a number of improvements at exits 48 and 47 on the Maine Turnpike and at the intersections along Route 25 (Brighton Avenue/Main Street) have been, or will be made, Campbell said. The 155,384-square-feet of development planned in the first phase will be serviced by 606 parking spaces and a METRO bus stop. The proposed location of the stop has been shifted west of the entrance road and will connect to a sidewalk that will bisect the parking lot and lead right to Market Basket. The Market Basket building, which is expected to open by next fall, will be designed in a way that “pays homage to the mill history in Westbrook,” said Waterstone Properties Group Vice President of Development Doug Richardson. Motorists entering the main parking area would do so via a right-turn slip lane at the front of the property or a roundabout at the rear of the property. David Floyd, a principal at Site Solutions, a Atlanta-based landscape architecture firm, said a lot of work has gone into screening the development and its parking lot from passers-by. “This is our front door to the experiential side of the property, which will be phase 2, so we were cognizant and concerned about the street frontage,” he said. Planning Board Vice Chairman Rene Daniel was a fan of the landscape plan. “What I see on phase 1, I am pleased with. Very, very pleased,” he said. Since the property straddles the Portland-Westbrook line and includes property in both communities, both Portland and Westbrook will have to sign off on the project. Perkins-Thompson attorney Jim Katsiaficas, who is helping Waterstone plan the project, asked the Planning Board to waive the joint review requirement when that time comes. Portland would do the same, meaning Westbrook would approve the project and Portland would sign off on it administratively. While Tuesday’s meeting only focused on the first phase of the project, earlier this summer Waterstone shared its complete vision for the property. Plans include a 26-acre recreational area at the quarry; an 8,200-seat concert venue at the corner of the property by Westbrook Arterial and Larrabee Road; a 12-screen movie theater; 300,000 square feet of office space; 750 residential units; two hotels; 100,000 square feet of primary care, specialty care and rehabilitation offices; an outdoor plaza for ice skating or outdoor movies; and a 25,000-square-foot brewplex and food hall. The residential units would be marketed to millennials or empty nesters and be phased in over a 10-year period. Waterstone Properties Group Principal Josh Levy said last month the goal of the Rock Row development is simple: create a place where people want to come and spend time. Doug Richardson, vice president of development for Waterstone Properties Group explains the architectural look of the proposed buildings in the first phase of Rock Row, a mixed-used development planned on Main Street by the Portland/Westbrook line. The first phase will include a Market Basket, a bank, a restuarant and several other retail spaces.